A Common Ghost or a spirit of a departed ancestor It is believed in India that a spirit of departed ancestor troubles only his descendants to settle his give and take account with them, On the other hand, a ghost troubles any human being, using its black energy regardless of them being their descendants. Ghosts of Hindu men who died by violence and whose corpses were disposed without getting the death rituals done for them by their family." They are said to be very powerful and mean. They have a strong odor around them, like that of a rotten egg. Generally, they affect the person without possessing. Their main duty is to provide material required for doing black magic, for example bones, skulls etc. or to help sorcerers or m?ntriks digging out bodies from the cemetery for their rituals. They are the witches in subtle form with foul smell. People possessed by Witches (Chetkins) laugh continuously. Chetkins can take various forms. They possess a person to cause accidents. They also take control of subtle bodies of their victims to make them work according to Chetkins wishes. They also train them in performing rituals to manifest black energy. They are capable of taking complete control of a house and can then devastate the entire family living there. 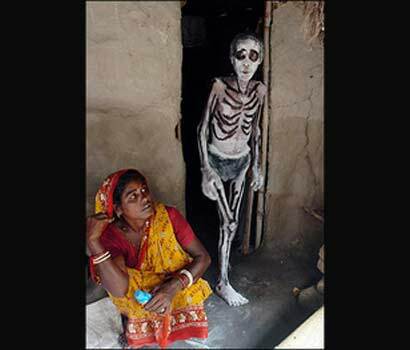 Mumiai is an Indian poltergeist that invades most of the homes throughout Mumbai area. They are small spirits that appear surrounded by a reddish mist and make guttering noise. These are the ghosts of women and girls who were either deprived of or faced failure in love and committed suicide. They are also the spirits of those women who dies with unfinished wish of physical desires. It is said that they return as vengeful spirits. Most of them are given domain over a certain area which they haunt. They are said to seduce males who fall for their charm and fulfill their physical needs. People in India have different thought on them. Some say that these spirits are harmful as they use their victim till his death. Some say these are the spirits which gives material gains to their victim in exchange of physical satisfaction. These kinds of Spirits are also mentioned in western Demonology especially known as Incubus or Succubus. Incubus is a male inhuman spirit which uses women to satisfy their unfinished physical needs. Succubus on the other hand is the female version of Incubus. They are the ghosts of married women who died in early stages of their marriage either due to any accident or illness. Some say that the women who are killed for dowry become such kind of ghost and return to haunt their killers. These are considered little dangerous but easily taken out of house. Another female ghost often mixed up and confused with the Shaakini. These ghosts are that of women who died an untimely death due to any reason. They are little mischievous ghosts. People say that these ghosts are those of children who died at early childhood. They seem to have a naughty and mischievous nature that of a child. It is a rare ghost, the Penchapechi takes the form of owls and haunt the Bengal forests. The ghost follows travelers through the woods until they are completely alone before it strikes. Unlike other ghosts, the Penchapechi actually consumes its victims, feeding on their body almost like vampires. They are the ghosts of Brahmins, and might bless you if you keep them happy or become your worst enemy if you disrespect them. They are the headless ghosts of people who died in train accidents or any other accident and lost their head. They are the ghosts or phantom travelers who call people by their names in the night at a way of forest and lead them away, the people called by a Nishi are never seen again. These ghosts are famous people who died and are worshipped today as part of an elaborated ritual. These are lustful female spirits who pray on young men for their physical needs. We call them Succubus. These are the ghosts of people who died by drowning in the river of lakes. They are said to be short, muscular and are also known for their strength. They are reported asking people for alcohol or tobacco to spare their lives. If refused, they drag the person inside the lake or river. They are the most distinguished kind of female ghost who are said to be alluring travellers and kill/possess them and are reported living mostly on Banyan tress. A holy spirit dressed in white clothes and a white turban, sometimes seen on a white horse who guards Namghars, the community places of worship where the sacred Bhagvat Gita is kept. A malevolent ugly ghost that sometimes kills a person and takes on the corpse' s appearance.Often said to be found near isolated ponds and lakes. Khabees is a type of Inhuman Spirit belonging to the Jinn family. Khabees are said to be living with their family. Where ever they live, they live with their family member and they also marry, have kids and have power to demean humanity. Has the hooves of a horse, but is otherwise human. Some stories show it as helpful, while others call it so deadly that you die when it looks at you. Like all poltergeists in the rest of the world. Usually said to be set lose on a family by an enemy. People summon them to unleash them on enemies in order to eliminate and torture them. A female demon that often tries to lure males and kill them. A storm which takes place in Assam every April . This storm is said to be the storm goddess which returns to her husband's house after visiting her mother for the Assamese new year which is around that time. These are tiny, mischievous ghosts who steal rice and sweets from a house Kitchen. Believe me, this list does not end here. There are many more types of ghosts in India. I will keep updating this blog as I get to know more names. Hi Gaurav, wow, lots of ghosts in India! Interesting post! Page created in 0.07 seconds with 138 queries.